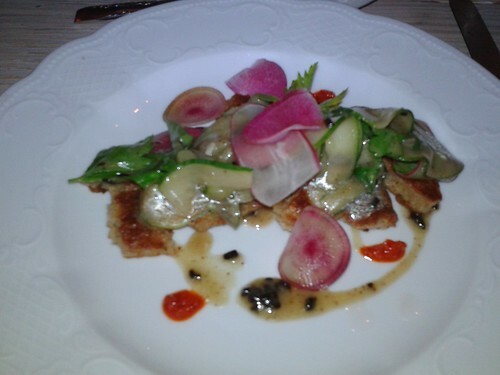 When Lazy Smurf invited me to join her and two other bloggers for dinner at Lenoir, I was excited. I don’t get many opportunities to dress up and try the latest hit restaurant. If you follow along with the Fall Lenoir menu, you’ll see that our four courses were largely made up of components of other dishes. 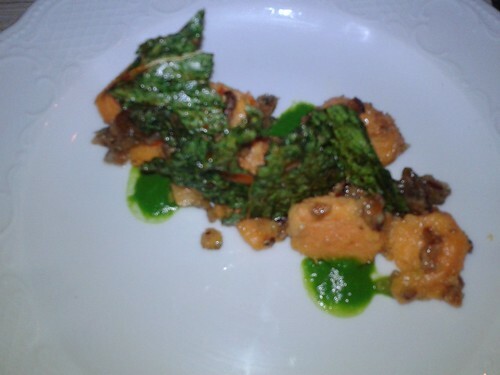 The second course was a sweet potato dish. Cold sweet potatoes were dressed with granola, arugula pesto, and kale chips. The kale chips were a great crunchy contrast against the soft sweet potatoes, and the arugula and kale kept this from veering toward Thanksgiving casserole territory. The third course is what won me over completely. After two cold salads, I was beginning to worry I’d leave a bit hungry after grazing on (tasty but) dainty vegetables all night. Much like the first course, there were lots of components playing together, but here I think they worked together perfectly. In the center is a packet of zucchini slices stuffed with a quinoa and eggplant mixture. The zucchini is sitting on a bed of mustard greens and a pool of curry sauce. On top of the zucchini packet are thin, roasted slices of okra and shishito peppers. Thin slices of okra mean that you get a great, crispy texture without any of the okra’s hated slime. Around the dish is a garnish of corn and pomegranate arils. The pomegranate arils and corn provided a bit of crunch in each bite. The total result is a warm, comforting, filling vegan dish. I was also thrilled with the final course. Upscale restaurants tend toward fruit platters and fruit sorbet for vegan desserts, so to receive a warm dish with multiple components was delightful. 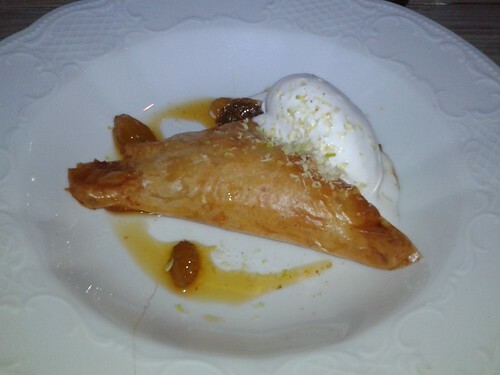 Crispy filo pastry stuff with warm apple filling and paired with coconut sorbet (such a different beast from fruit sorbets) and rum raisins. It was a perfect ending to a great meal. 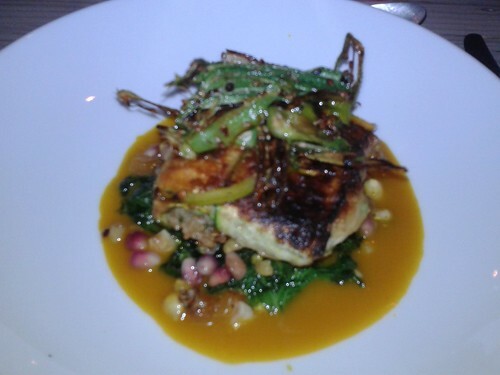 I highly recommend Lenoir as a restaurant for vegans looking to celebrate a special occasion or just eat something a little out of the ordinary. I do suggest calling ahead (as we did). While these four courses were made largely of components of other dishes, there’s no way we would have received such thoughtful dishes without notice. This entry was posted in Fancy Feast, restaurants, veganmofo and tagged austin by mollyjade. Bookmark the permalink. Nice nice nice. I forgot about the shishito peppers, that dish was so good. Nice, detailed descriptions of the courses!